Cole thought he was Superman. He jumped “higher, higher, higher into the air” and went bam! on the edge of the coffee table. I took him to Urgent Care once Hubz got home to watch the other 2 boys. 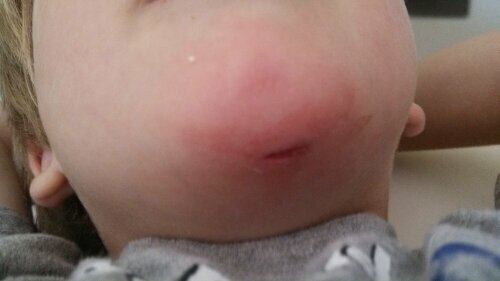 Three lovely little stitches in his chinny, chin, chin…and a pediatrician appointment for next week. 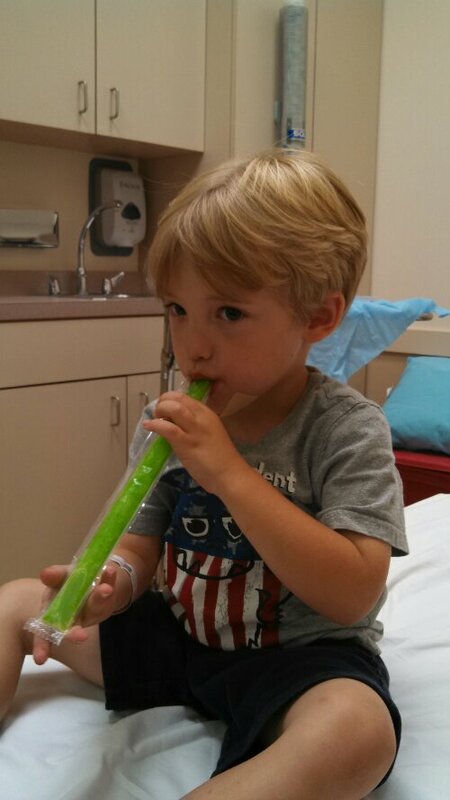 He got a green popsicle out of the deal, so he was, in his words, “all good”. I am exhausted. Tate was up around 3 am this morning scripting away in his room. Now that he and Jake share a room, though, I need to be careful about that scripting. Sometimes it gets very, very loud. Tate has very little volume control. We are trying to work on it, but he’s just a naturally loud, boisterous person. I can’t really change that. He was quiet for about 30 minutes. Then he sat bolt, upright and cracked his neck. *shiver* At the same time, Hubz and I whispered, “Tate, stop!”. Tate responded, “Awww, puppets!” I know it’s a script from watching “Max & Ruby”. Oh yay. He laid down, only to pop up repeatedly over the next 30 minutes or so with a script or a neck-crack. Hubz grabbed pillows. “C’mon, Tate, we’re going to go sleep in the basement.” I mumbled my thanks and tried to drift off to sleep. I was able to get in a little more rest before Jake moseyed into my room just shy of 6 am. He wanted to tell me that Tate was missing. I relayed the story about Tate’s having a rough night. Jake nodded his head in acknowledgement. “Oh, I get it! Tate was having his brain go crazy!” (Remember, Jake uses that phrase when he is trying to explain how his ADHD is affecting his focus and thought.) I tousled Jake’s hair and hopped into the shower. At least we ended the morning with a giggle…even if it was a little smelly for a bit! !